"The whole placement was just magical! The beauty of the country, the friendliness and spirit of the people, the friends I made and the amazing children made the whole experience memorable." After flying all the way to the other side of the world, you deserve a good rest. Therefore, on arrival, you will be met at the airport by two friendly members of staff from the Excelsior Hotel. They will be looking out for you and holding a Projects Abroad sign. They will then drive you to the hotel, which is in the centre of Kathmandu in an area called Thamel, to relax and have some food. The same or next day (depending on your arrival time), a member of staff from Projects Abroad will meet you and take you on a tour of Kathmandu. They will show you the banks, the post office, the best place to cash traveller's cheques, and the internet cafés. After a general introduction to the area, you'll then be taken to your accommodation. You may also visit your placement on the same day, or the following day, depending on where you are based. Some volunteers can walk to work, others may need to take a local bus, if this is the case you'll be shown the route to work and where to catch the bus. Please note you will need to cover the cost of this journey, which will cost less than $1 a day on average. Most of our accommodation in Nepal is with families. We have been working with most of our families for a long time and they will treat you as one of the family. They are interested in what you are doing and are worried if you come home late. Just always tell them where you're going and when you will be back. It's really a home far from home. Depending on what placement you are on, you may be staying in Kathmandu itself, or in the rural Kathmandu Valley. If you are wondering about the local food, there is a huge variety but the most popular is dhal bhat, a dish of rice and lentil soup (so vegetarians will be absolutely fine). If you want to have a taste of back home, Nepal has adapted famously to Western tastes, in Thamel you will find: Italian Pizza, Mexican tacos; Japanese sukiyaki; Thai chocolate; Chinese marshmallows; onion and minestrone soup; borscht, quiche and soy burgers and some of the best desserts - apple and lemon pies, almond layer cakes and fruit cakes. To wash any (or all) of these offerings down, try a lassi (a refreshing mixture of curd and water), the locally produced beer or chang, a Himalayan home brew made from barley. "I had never been to Asia before so I didn't really know what to expect. The Nepalese people are friendlier than you could ever imagine and the social life was a lot better than I expected." 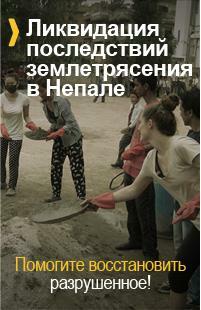 "Although Projects Abroad do not force you to meet other volunteers the option is available. The volunteers themselves create a community and pass on tips to the next group. There will always be someone there who you will get on with. By Projects Abroad allowing people to choose their own travel dates there are always new people coming and going." Deborah Pitman, Teaching Volunteer in Nepal. Once at your placement, you'll sit down with the placement supervisor and discuss a timetable of work, and what your interests are. If you have any questions or problems our staff are available 24 hours a day by phone. When travelling to Nepal, always bring your hiking boots and a camera. Nepal is famous for all its treks and the local people and scenery are sure to provide you with some great memories!